Fighting to clear his name, apartheid era cop Joao Jan Rodrigues says he should benefit from amnesty former president Nelson Mandela granted, or an agreement reached at the highest level of government, that politically motivated crimes preceding 1994 would not be prosecuted. 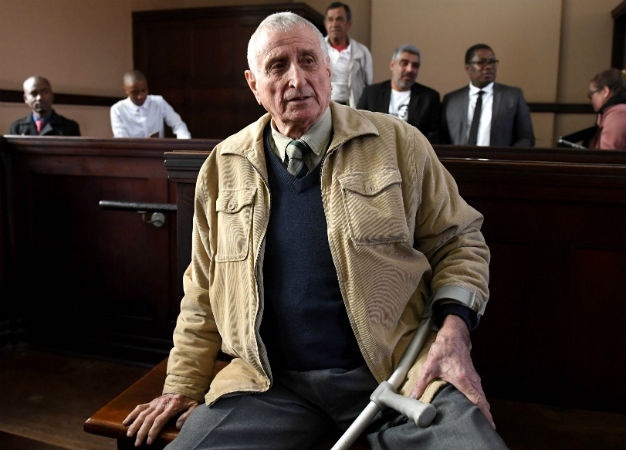 This was the submission his lawyer made in the Gauteng High Court in Johannesburg on Thursday in an application for a permanent stay of prosecution for his alleged involvement in the killing of anti-apartheid activist Ahmed Timol. But the state believes that Rodrigues should rather try to clear his name in a trial. Rodrigues faces charges of murder and defeating the ends of justice. His advocate, Jaap Cilliers, SC, also submitted that prosecution would infringe his constitutional right to a fair trial and his right to dignity because he would be tried at the age of 80 for an incident which occurred almost 50 years ago. Cilliers argued that the trial had been unreasonably delayed and that his client had not been properly informed of the charges. Timol was arrested in 1971 at the age of 29. The police in the interrogation room at the time, including Rodrigues, said the young teacher and activist from Roodepoort threw himself out of a window from the 10th floor of John Vorster Square, now known as the Johannesburg police station. His family refused to believe this and in 2017, the National Prosecuting Authority held another inquest, which overturned the 1972 finding that he had died by suicide. Cilliers submitted: "The objective facts in this case are of course that [the] applicant has only been charged more than 47 years after the death of the deceased." "There was enormous delay by the [State] to proceed with the prosecution against the applicant of more than 47 years." Cilliers added that there may have been political "pressure" on the Director of Public Prosecutions to delay the matter after the conclusion of the Truth and Reconciliation Commission (TRT) proceedings. "These proceedings were finalised during the later 1990s, and the [State] waited for 18 years before submitting the request for the re-opening of the inquest in the Timol matter," said Cilliers. He said he found it interesting that the re-opening of the inquest was the first of its kind by "a High Court and presided by a judge of the court". However, the State's Kennedy Tsatsawane, SC, says a permanent stay of prosecution will not help anything. "The applicant himself can only clear his name through a trial and not by a stay of prosecution," Tsatsawane said. He disputed that a trial would infringe Rodrigues' rights and said "a criminal court is also responsible for ensuring that accused people have a fair trial in exactly the same manner promised in the Constitution". Tsatsawane added that unless it was properly established, with admissible evidence, that a fair criminal trial would be impossible to achieve, there can be no basis to accede to the claim for a permanent stay of prosecution. Rodrigues' application, which began on Thursday, is set down for 2 days. The order of the full Bench is expected on April 8. The families of former ANC president Chief Albert Luthuli and Black Consciousness Movement founder and anti-apartheid activist Steve Biko watched closely from the gallery. Biko died in a prison cell in Pretoria, while "Inkosi" Albert Luthuli was hit by a train near his Groutville home. The families of both activists previously made it known that they want more answers around their loved ones' questionable deaths. Timol and Biko are just some of 73 anti-apartheid activists who died in detention between 1963 and 1990.